The offer this month is 10% off the usual retail price of the selected products illustrated in this issue of the Newsletter, simply enter coupon code earlybirdjune at the website checkout. The Early Bird offers are available until midnight BST 30th June 2016 , when ordered direct from the website as downloads – if you wish to buy printed copies please visit our Ebay Store (stores.ebay.co.uk/Frandor-Formats). I hope you find something to inspire you. The weather continues to be unsettled in East Anglia and we experienced some really blustery wind yesterday, followed by a lot of rain through the night. Which is rather off putting to me to start on any summer stuff! However, I will probably be caught off guard if procrastinate in that area. Did any one see the wonderful display of knit and crochet flowers at The RHS Chelsea Flower Show either in the “flesh” or via newscasts? A most note worthy effort master minded by Australian designer Philip Johnson, who had won Best Show Garden at Chelsea in 2013. He linked up with Lynn Berry and Margaret Knight, two textile artists. 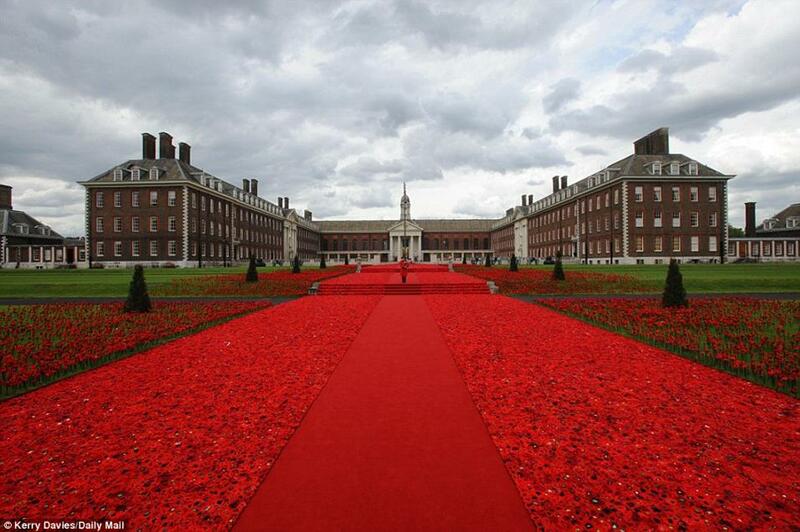 The poppies are to be sent back to Australia to commemorate the centenary of the Battle of the Somme on July 1. This sewing pattern is to make a little bag which is the ultimate in compact hours of fun on the move! It’s a fashion statement for Mini Mums. Not only that, it has a dual purpose. Inside is a cradle to fit dolls up to size 6.5ins/16.5 cms, which makes it particularly suited for the smaller Baby Born mini world doll and similar. The cradle has a comfy mattress, with matching pillow and frilled top cover. All of which can be classically plain or embellished to Mini Mum’s specifications. This accoutrement is ideal for travelling. A handkerchief, a few sweeties and pocket money can be tucked inside and a little change of clothing for the occupant, placed under the mattress. All secure in the drawstring bag. No more fidgety, little bored princesses, waiting for Mum to catch up with the latest news when she meets her friends. Instead, the bag can be opened and the cradle displayed for playing with the little doll and if another Mini Mum is also on hand with her Dolly Bag, then it will be the big Mums fidgeting to get away when the news is exhausted! 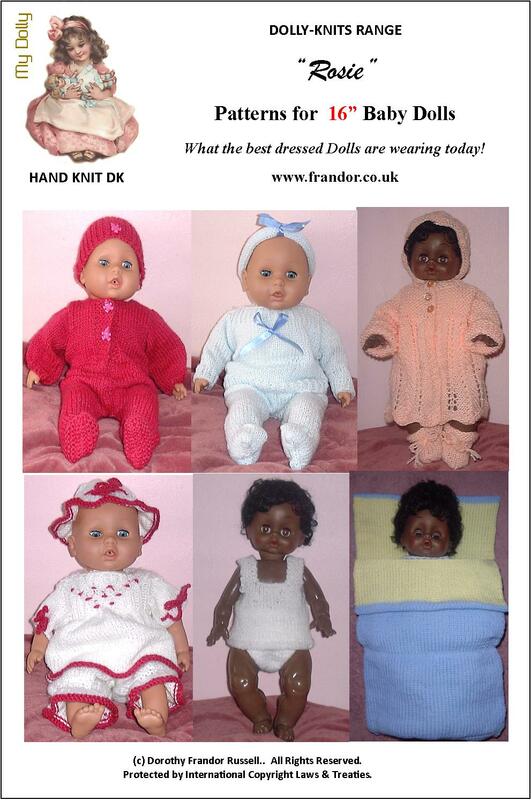 These are two sets of patterns, sold separately, for 11-12 ins (28-30 cms) fashion dolls. “Daywear 1” contains 8 outfits which include: Mini Skirt, Sleeveless Top, Pants, Multicoloured Hat, Jump Suit, Cable Sweater, Trousers – Male, Sun Dress, Floppy Hat, Poncho , Trousers – Ladies, Picot Pull on Hat, Long Line Denim Jacket, Jeans–Male, Striped V neck Sweater, Trousers–Male and Track Suit. 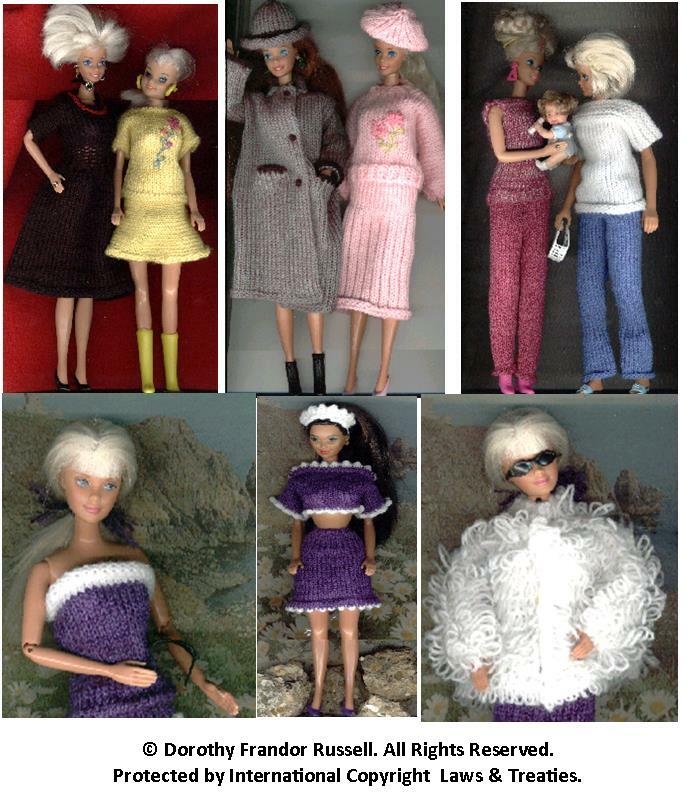 “Daywear 2” includes: Ladies town coat and hat, sideways knit A line skirt and top, day dress, ribbed skirt, top and beret, short/long sleeved tunic and flared trousers, body tube, mini, midi and maxi straight skirts, and a “loopy” jacket. These two collection of patterns are part of seven collections. Collections 1-6 contains patterns for over fifty outfits. Such a large selection gives an endless number of ensembles by mixing and matching. Collection 7 is a compilation of garments covering mid 19th century to modern day fashions. “Daywear 1” & “Daywear 2 are now listed on the website: www.frandor.co.uk, Craftsy & Etsy as downloads. Cardigan, Hat & Mitts set. 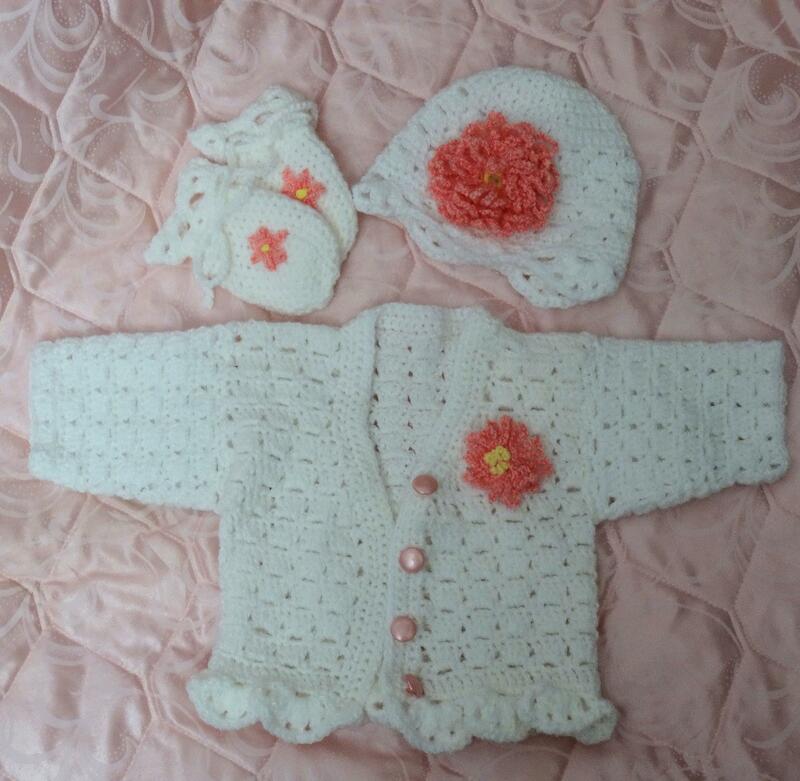 This crocheted set is in 4 sizes: low birth weight, 0- 3 ms, 3-6 ms, 6-9 ms. 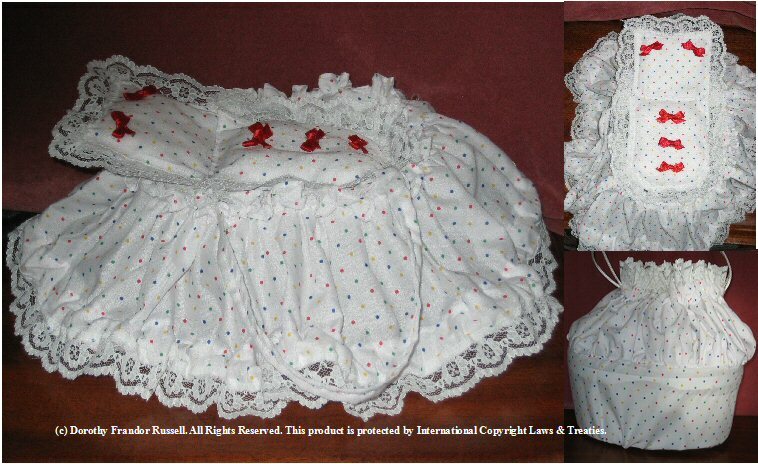 Although the photo shows an outfit that is suitable for a girl, the mitts are written up with a boy’s version too. Also, by omitting the scalloped edging from the hat and the hemline of the cardigan and the flowers, and working the button border as the boy’s instructions, this set is suitable for a boy too. A Sweater with matching leggings and headband. An Angel top with matching pantaloons and brimmed hat. All are knitted in stocking stitch with the exception of the pink outfit which is an easy 2 rows lace pattern sequence. It looks complicated but isn’t!